For many years we would go over to the Isle of Wight and stay alongside the visitors moorings above the chain ferry on the East side of the river. It’s relatively quiet and sheltered from any swell that comes in, especially when here is any north in the wind. That part of the river is home to many interesting boats including for many years Misty Moonbeam an unusual and bespoke schooner around 90feet or so. 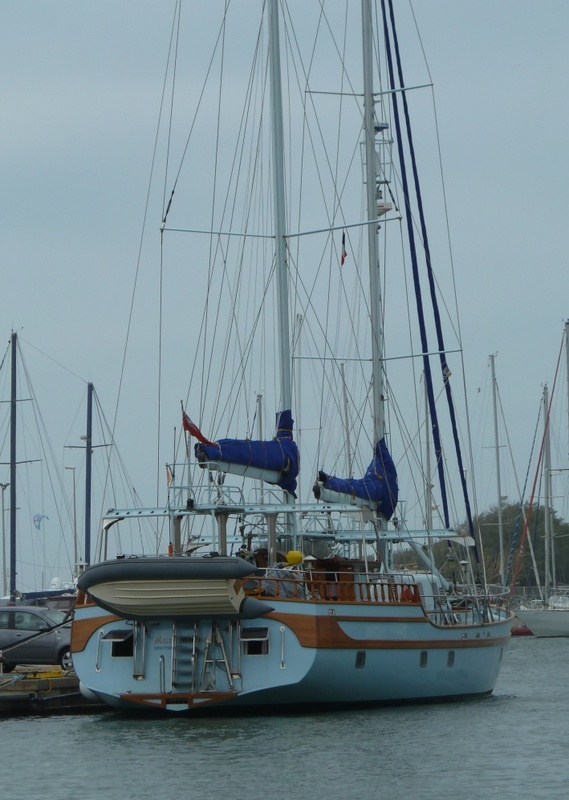 Misty was an out and out long distance cruising boat so when she disappeared about four years ago we guessed that she had sailed off to distant horizons. 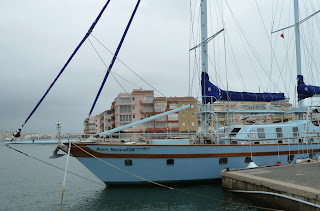 So it was nice a surprise to see her alongside at in the marina in Cape D’Agde in the South of France. The sheer scale of the boat is incredible, the booms are so high above deck that these special gantries are necessary to gain access for sail handling. Could be a very bad place to be standing in a gybe!! I recall counting the winches once when were alongside in Cowes, I forget the exact numbers but there were around a dozen at the base of each mast. 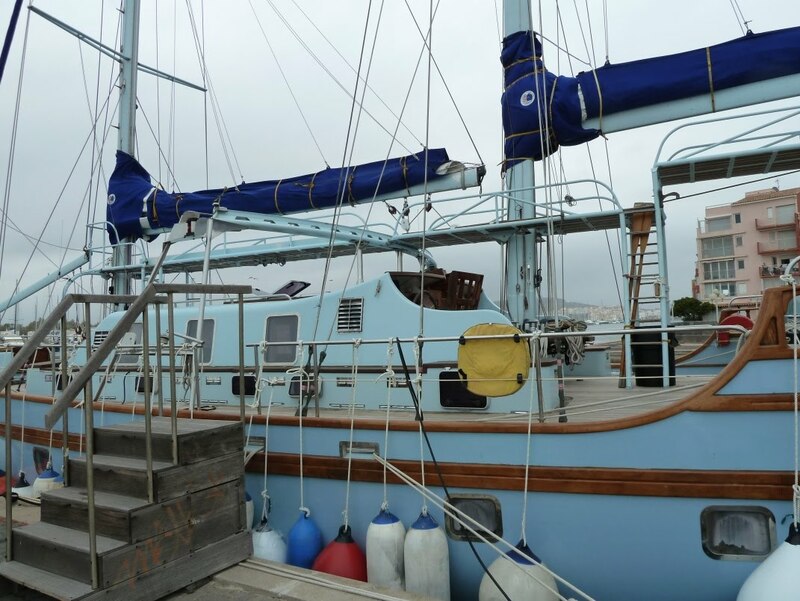 As a live aboard home, she must be fabulous, although I doubt that Erica and I could sail her without additional crew, which makes demands on the extra space, organization, provisions etc. Hmm, nice, but I think I’ll stick to something we can sail just the two of us – of three if you count Joe. Interesting to look at. You are right though. There are a lot of limitations that come with a much larger boat. 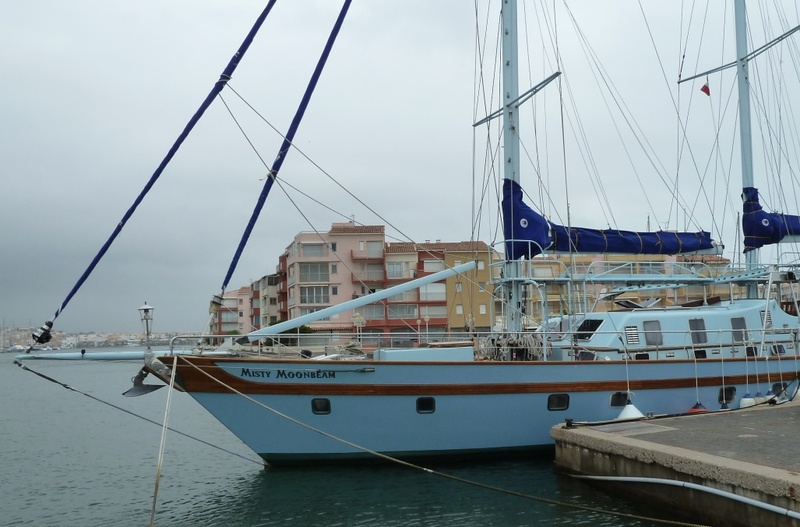 More crew to sail her, plus many coves and small bays become inaccessible. 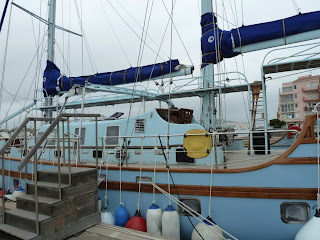 I saw the misty Moonbeam in november of 2010 in Padstow harbour. She was at that time catalogued for sale at around £395,000 pounds. I believe she has been sold and is now abroad somewhere probably where you said. 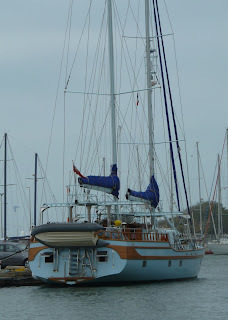 A fine looking boat which appears on Flickr as Misty Moonbeam in Padstow. I live in Cap d'Agde .. The boat is still there .. I send a message to the owner: we can make it move!